Vehicles that operate only on electricity require no warm-up, run almost silently and have excellent performance up to the limit of their range. Also, electric cars are cheap to "refuel." At the average price of 10 cents per kwh, the cost ratio is around 2 cents per mile, and can be recharged at night, when generating plants are normally under-utilized. 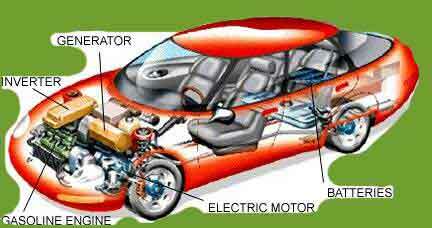 Vehicles that run on electricity only part of the time and on internal-combustion power at other times, known as hybrids, have even greater promise. As hybrids gain in popularity, there is a growing interest in plug-in hybrids that allow owners to fully recharge the vehicle's batteries overnight. A strong appeal of the electric car, and of a hybrid is that when running on electricity, the cars produce zero tailpipe emissions. Even when emissions created by power plants are factored in, electric vehicles emit less than 10 percent of the pollution of an internal-combustion car. Pure electric cars still have limited range, typically no more than 100 to 120 miles. In addition, electrics typically require long charging times, which, in effect, reduces their viability. When connected to a dedicated, high-capacity recharger, some can be recharged in as little as an hour, but otherwise such cars are not drivable while they are charging. Outlook: While interest in plug-in hybrids grows, the long-term future of pure electrics depends on breakthroughs in longer-lasting, less expensive batteries and drastically lower production costs for the vehicles and the batteries themselves. Only a small percentage of the nation's electricity comes from renewable resources; about half is generated in coal-burning plants.